Enjoy the alternative rainbow mountain for yourself in a unique expedition away from the huge crowds. Photograph the milky way with Ausangate mountain in your composition (depending on the weather conditions). Enjoy the natural hot springs in the village at the foot of Ausangate. Photograph the beautiful 7 lagoons in the shadow of Ausangate at sunrise, see them in the most ideal light for landscape photography and in a unique way that you can never get in a normal day tour. Improve your photography skills with photography tips and assistance from your guide every step of the way. 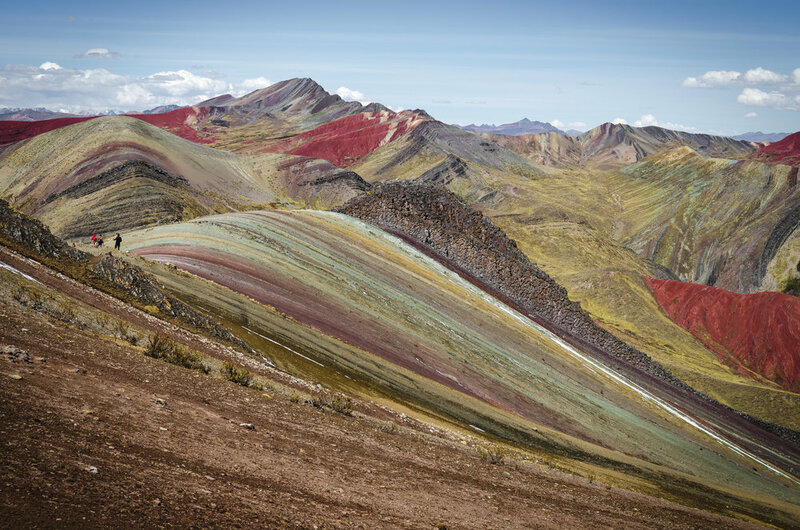 This expedition begins by taking you to the alternative rainbow mountain, away from the busyness of the more popular Vinicunca, here you can photograph the unique landscapes without the massive crowds spoiling your shot. After the rainbow mountain we stop for some lunch before we head to a beautiful village in the shadow of Mount Ausangate, here we spend the night at a local accommodation. Use this opportunity, if weather conditions allow, for some astro-photography as there is zero light pollution in this area, the stars are incredible! A very early start the next morning to begin the 1h30 hike to the beautiful blue lagoons of Ausangate for sunrise, enjoy this area in a way you never can from a single day tour. After spending a few hours here utilising the best light of the day to photograph these majestic scenes we return to the small village for a spot of breakfast and to relax, bathe in the natural hot springs, and have some lunch before beginning the journey back to Cusco. 06h30 - Pick-up from your hotel or hostel and depart from Cusco. 09h30 - Stop in Checacupe to visit the Inca bridge. 11h10 - Start the walk to the rainbow mountain, actually going through several different coloured mountains. Be ready to cross paths with the local wildlife, many Llamas and Alpacas! 12h30 - Reach the top of the rainbow mountain. time for pictures. 14h00 - Stop for lunch. 15h00 - Begin the 2h drive to the small village at the foot of Ausangate. 17h00 - Arrival and free time. Mingle with the locals or enjoy the hotsprings. 19h00 - Time for dinner, cooked by our host there. 22h00 - If the weather allows, have an astro photography workshop. 03h00 - Wake up and begin 1h30 hike to the lagoons, wrap up warm and bring a headtorch! 05h00 - Arrival at the lagoons, enjoy the best light of the day for landscape photography and watch Ausangate illuminate in the sunrise. 07h30 - Begin hike back down to the village. 09h00 - Arrival back at our accommodation where we can enjoy breakfast prepared by our host. 10h00 - Enjoy the village for the morning, take a rest, relax your muscles after the long morning in the hot springs, get the chance to mingle with the locals who will also have hand made textiles for sale, a great place to buy if you are looking for genuine product as opposed to in the city where they often come from a wholesaler. 13h00 - Lunch in the village with our host. 14h00 - Departure to begin the journey back to Cusco. Getting to the lagoons for sunrise is not essential, if you wish so we can get up later to head there. We do encourage arriving for sunrise though as it is the best light in which to photograph the landscapes. We can organise horse rides to the lake if you wish, this will however come at extra cost. 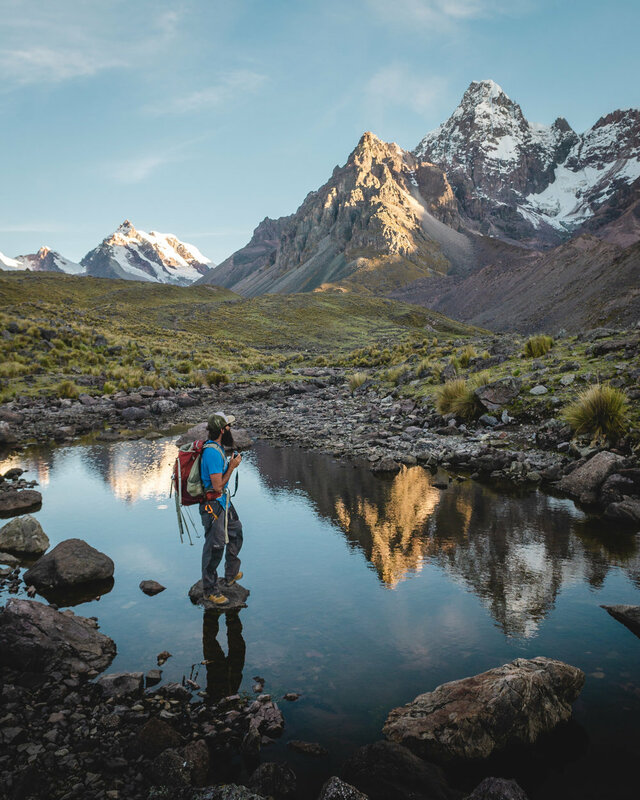 Weather conditions in the Andes are unpredictable so there is always a chance of bad luck, we wish we could control the weather but unfortunately we can not! Be aware that the months December through to March are the worst for rain, if you do book in this time frame, cloudy and wet conditions are almost inevitable. As an alternative to heading to the main lagoons area there is another trail that leads above the lakes to an incredible viewpoint overlooking the whole scene, not just of the 7 lagoons but of 6 more on the opposite side of the mountain. This is a more strenuous uphill trail and for that reason we only recommend it for those clients confident in their fitness and hiking ability, this is a spot that the usual tourists don’t know about! It will require an earlier start (2h30 am) to reach the viewpoint for the best light. Horses are not an option for this trail. If you request this route but we feel you may struggle to complete it we reserve the right to decline, this is for your safety and wellbeing. Private Transport the whole way. Entrance fees to the Rainbow Mountain. Food: Lunch and dinner on day 1, breakfast and lunch day 2. Horse ride to the lakes. Your Photography gear. Extra batteries and SD-Cards. Tripod for long exposure and night photography. Warm clothes for the night and the morning ( gloves, beanie, winter jackets, winter socks ) Rain coat in case of bad luck. Good comfortable walking shoes. Headlamp for hiking in the dark, essential! Sharp eyes and your smile!